This document explains how to generate a DRDA trace with the StarSQL DRDA Trace Recorder. DRDA traces are helpful to resolve problems that result in an unusual DRDA reply code point, a language conversion error, an application GPF, or a DB2 error. A DRDA trace is not a substitute for an ODBC trace. See How to Generate an ODBC Trace for instructions on creating an ODBC trace. You can find the DRDA Trace Recorder in the StarSQL program group. 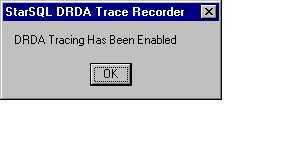 A magnifying glass icon will appear in the system tray when the Trace Recorder is active. 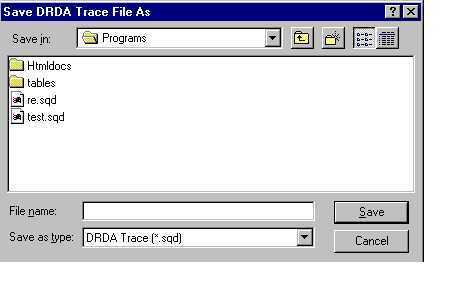 A dialog box entitled Save DRDA Trace File As will appear. Enter a file name and change the Save in directory, if desired, and click Save. You will see a message that says: "DRDA Tracing Has Been Enabled." After you have reproduced your problem, turn off tracing. Right-click on the magnifying glass icon and select "Stop Trace" or "Close". You will see a message that says: "DRDA Tracing Has Been Disabled." The file is located in the StarSQL\Programs directory by default and will have the extension .sqd. Please attach the file to an email and send it to StarQuest Customer Support. After collecting the trace, disable the trace with trcstart -off or delete $HOME/.swodbc.ini; we recommend the latter so that you are always using the current version of the system-wide $STARSQL/etc/swodbc.ini. To capturing DRDA traces from Windows services such as StarQuest Data Replicator, SQL Server Linked Server, and Oracle DG4ODBC, we recommend using the StarQuest StarPipes gateway. StarPipes an be useful in other situations, both UNIX and Windows, such as capturing traces from one particular ODBC data source. See How to Generate DRDA and Debug Traces Using StarPipes for Windows. Your support engineer will supply you the download URL and temporary license keys for StarPipes if necessary.